PRODECO, a Colombian mining company, needed to cross the Calenturitas River in order to provide access to the Calenturitas coal mine in Colombia, South America. Originally, PRODECO chose a cast-in-place concrete arch structure for the site. However, due to the remote jungle location of the mine, the cost and time to install the concrete structure was determined to be unacceptable to keep the project on track. 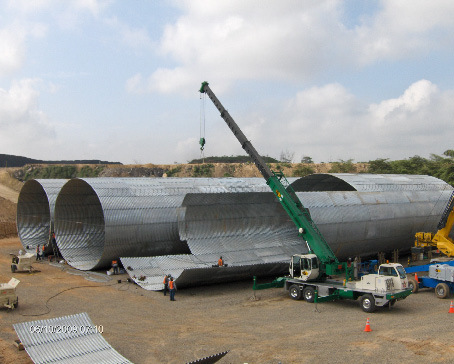 Working with Contech, the owners reviewed a new option and chose a triple barrel MULTI-PLATE® SUPER-SPAN structure. Its light weight and ease of transport made it the ideal solution for this remote location. The SUPER-SPAN is designed to carry a 1,375,000 lb. live load, suitable for the mine’s massive off-road dump trucks. The triple span, horizontal ellipse structure is capable of conveying a design flow of 32,000 cfs. The erection of the SUPER-SPAN was completed in just 28 days.